Lighting Control System controller and sensor are located right in the fixture. 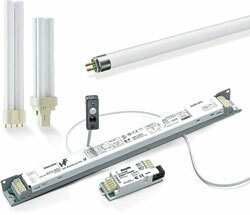 The ActiLume fluorescent lighting control system uses Advance DALI-compatible ballasts. A service button on the systemâ€™s sensor unit commissions occupancy sensing and daylight harvesting. Can drive up to nine ballasts per system while controlling up to two zones independently. Designed for small open offices, meeting rooms and private offices. Features low-profile housing.